Last month, Apple delayed the launch of its all-new AirPods beyond the late October timeframe it originally promised, saying it needed "a little more time" before the wireless earphones are ready for customers. Since then, AirPods have remained listed as "currently unavailable" on Apple's website. Shortly thereafter, a report citing supply chain sources indicated AirPods will not launch until January 2017, suggesting they will not be available in time for this year's holiday shopping season. But that timeline would seem awfully late, especially considering some Apple retail stores have already received AirPods demo units. Conrad's website still says AirPods will be available for delivery in 7 to 8 weeks, so it is entirely possible the employee provided incorrect information, but there now remains at least some hope that customers will be able to purchase AirPods in time for the holidays. Nevertheless, treat the conversation as anecdotal evidence at best. I know a lot of people will bash Apple for the delay on these (it is MacRumors forums, after all), but it is better to get these right than to follow the Samsung model and rush these out to store shelves. Demo AirPods? You mean, where anyone can try them on? Must've found them in between the seat cushions. It is now November 10th. It's hard for me to believe these will be available by black Friday at this point. Wouldn't they be advertising that fact like crazy? They won't need to advertise them. As soon as someone gets a whiff they're released and it filters out, they'll sell like crazy. I'm happy to hear something about these finally since I'm wanting to retire the lightning connector EarPods. 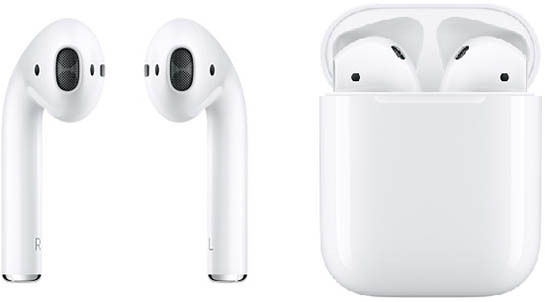 I will admit I'm going to buy these without trying them out in an Apple Store since I am not willing to stick earphones in my ear canal that have been in 1000s of other people's ears. Yes! I'm so excited for these! I just hope they don't "release" to a 2-4 week backorder. I walked around with 2 Oral-B toothbrushes hanging out of my ears, to find out the feedback. Hence I decided this isn't for me. Please. Please. Please be true. Next Friday. I called it. I thought they'd be released either tomorrow or next Friday. There's no way they'd have us wait until 2017 for these. these are gonna sell out fast! I've been refreshing the store page multiple times a day for the last few weeks. Can't wait!